Purpose: To investigate image quality, and radiation dose between ECG-gated singlesource and dual-source CT Angiography (CTA) protocols for planning of Trans-catheter Aortic Valve Implantation (TAVI) with a reference non ECG-gated single-source protocol. 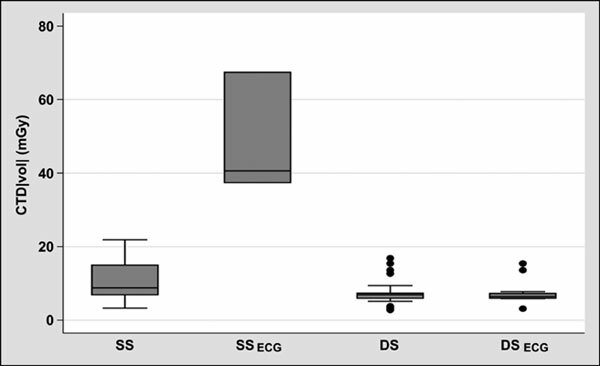 Methods: A total of 120 patients were included in four groups: Non ECG-gated single-source (SS), ECG-gated single-source (SSECG), ECG-gated dual-source high-pitch (DSECG), or non-ECG-gated dual-source high-pitch mode (DS). Qualitative image quality of the aortic annulus, aortic valve, and coronary ostia as well as presence of motion or stair-step artefacts of the thoracic aorta were independently assessed by two readers. Quantitative image quality was assessed to calculate contrast to noise ratio. Results: Subjective and objective scoring of motion artefacts was significantly reduced in SSECG, DSECG and DS (p= 0.010). The imaging length was comparable between groups. Aortic annulus, aortic valve, and coronary ostia were reliably evaluable in all patients with SSECG, DSECG and DS protocols. Conclusion: High-pitch, dual-source CT angiography of the whole aorta with or without ECG gating is a dose-efficient and time-saving examination strategy before TAVI. However acquisition timing within the cardiac cycle needs to be taken into account. TAVI, CT angiography, aorta, high-pitch, dual-source CT, radiation dose.